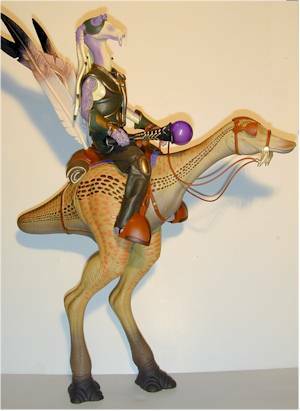 The 12" onslaught from Hasbro continues in the Star Wars line with this latest exclusive, Captain Tarpals and his Kaadu. This is a Target exclusive again, and retails for $60. It's one of the more expensive of the beasts so far, but not as painful on the pocketbook as the Dewback. Thanks to Larry Jones for letting me shoot pictures of his foot loose and fancy free Kaadu! The new boxes that Hasbro has been using are quite nice. They hold up to damage fairly well, it's easy to see the figures in all their glory, but of course you can't open them up without destroying it all. Okay, so Hasbro has a way to go to catch up to the other 12" manufacturers out there, but this Tarpals is an improvement. He has neck, shoulders, cut elbows, cut forearms, chest, waist, hips, and knees. 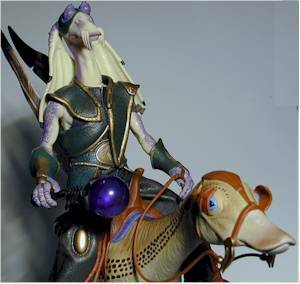 That makes him slightly more articulated than the 12" Jar Jar, and certainly less annoying. I'm calling the Kaadu an accessory here. And as beasts of burden go, he's one of the two best they've produced. He's articulated at the legs only, but stands very well on his own and with Tarpals riding him. Scale is accurate for a change, although Tarpals seems a little large. If you look at the pictures though, and the Kaadu's height compared to Tarpals, the scale is awfully close. The saddle, stirrups, bridle and feathers are all well done. 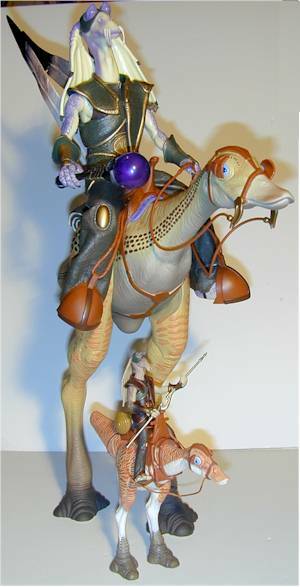 Tarpals sits on the poor Kaadu with his feet in the stirrups, and his left hand is formed to hold the reins. I wish all the 12" figures were this nice. There's also his altatl, which fits in his hand well. It's a nice addition, and obviously appropriate. Good sculpting on both Tarpals and the Kaadu. Unlike the Dewback, the Kaadu is faithful to the source material. The paint application is great as well, and makes the figure look even better. Tarpals outfit is nicely done, with good stitching and good materials. The design is great, and it doesn't restrict his movement in any way. Sixty bucks? Yep, it's a great set, but the Taun Taun wasn't sixty bucks, and that is still my number 1 pick for 12" beasts. At least it isn't a pile of garbage like the Dewback. This is one of the two best 12" Beast sets, right behind the Han/Taun Taun of a couple years ago. The unfortunate part is that they did such a nice job on such a meaningless character. 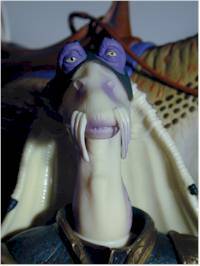 How many people are really going to care about a $60 second rate Gungan?